Radio stations can broadcast some additional data along with the songs they play. Devices with RDS feature can display this data. N78 is one such device. 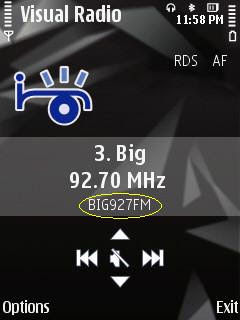 Wasn't sure which radio station supports it but yesterday saw it in action while playing Big 92.7 FM. That circled text is RDS, usually its used to show track information or some advert. The RDS/AF usually dimmed, brighten up once RDS reception starts. Wonder how to make FM transmitter work, don't think its supported in our region. During my travel I walked - took a bus - took a train and last took an auto. My experience with the N95 GPS fix quality in buses and trains has not been so good, so this time I used the N78. As can be seen on the map, I lost the fix just a couple of times. I took care that I was standing near the door or window of the bus/train. All the while the app constantly kept updating the speed, map plotting, latitude/longitude and all the graphs pretty accurate. A day earlier when I tried out the app I was amazed to see that it even counted the steps I took accurately. Although I could have uploaded my track once I reached office I choose to show it live so that my friends can track me in real-time. Any photos taken along can be uploaded and as they contain location info they can be seen along the track exactly where I took them, applies even to videos taken. Here's the link to my track. Click on the pics I've taken to see description. Even updated my sidebar to show a widget of my track. Get your own widget from here. The N96 is coming and Nokia is going to make sure that its presence is felt. Its announcement was made on 19th in New Delhi and the device will be available in September. The timing is just right. Every one under the impression that the iPhone is going to cost just $200 (8000 Rs) will be utterly dissapointed , now that the actual prices have been announced i.e. 31K for 8Gb and 37K for the 16Gb. Even the ones who can afford it will now be having second thoughts. - Is the touch screen that important? - Will there be a good resell value for the iPhone? - How easy is it to install applications on the iPhone? - Why buy form Airtel or Vodafone, why not any store of my choice? I do not hate the iPhone. I love its user interface and thats it. Will I pay 30K+ for a phone just because I like its user interface? NO WAY. The N96 too i believe will be 30k+ but atleast it has all the features to justify the price. the time when you want a particular profile to change. Load any of the push mail clients be it Mail for Exchange or provided by operators & access your corporate e-mail. Register yourself to My Nokia from your device & receive tips & tricks on how to increase the productivity of your N96. SMS alerts are sent to registered users educating them on different shortcuts to perform a task in the least possible time. For e.g. Long press the Menu key to know the "Open Applications" & press "C" key to close the running application from the open applications window itself. -In N96 you not only get a Music Player, but also get a access to a online Music store to purchase music. With FM radio you would never run out of music & with dual speakers you get the best in class audio quality. The innovative music player lets you play the music as per the Artist, Album, Genres & Composers. This make a song search a lot easier. Buit in 5 Mega pixel camera with Carl Zeiss Optics Lens gives you the best photographs possible. You not only can click photographs but share them online from the phone directly. If that is not all you can upload the same post location tagging, so that you can remember the exact place where the photograph has been clicked. - With Nokia PC Suite, you can effortlessly transfer all your photos with a single click of a mouse. Run more than two applications at any given point of time. For e.g. open a PowerPoint, playing a game, surfing the internet & typing a SMS at a given point of time. With N96 this will all be done with ease. To know what all applications are running simply click on options – Show Open Apps. 2. Auto Bookmarks: No need to enter the web address again if you have opened the web browser once. 5. Find: Find any text on the entire web page. operator for the GPRS settings. Keep downloading new widgets to your N96. Download the best of widgets for mobile devices. Download the same from Download! Application on your device or simply type http://widgets.nokia.mobi onto your mobile web browser to download more widgets. -Explore English, anytime, anywhere. Get the handy & trustable reference during meeting & presentation anytime. With over 2,40,000 words, phrases & definitions in A~Z format and help for spelling & grammar the OXFORD English dictionary in your N96 is the easiest way to increase word power, without carrying the thesaurus with you. Phone's screen on PC. Wonder never cease on N96. Now you can use your mobile to give presentations in your PC wirelessly. Screen Capture application enables you to view your phone's screen onto your PC by establishing a connection via USB or Bluetooth. Talk to your own people in your own language. With this application in N96 you just need to type in English & it will be converted into any of the 9 languages. Hindi, Punjabi, Gujrati, Bengali, Tamil, Telgu, Kannada, Marathi & Malayalam. Indi SMS application also integrates with message Inbox. Download more applications, try them for free via "Try for Free". Download Productivity application, ringtones,Wallpapers, games, themes & much more all via Download! Application on your device. Also try out this fun game contest (Project6XN) , if you are lucky enough you can win yourself a N96. Go here for service appointment and here for repair status. This may not be of any help right away but may be later, the form asks for State but lists cities, and there are no cities. In short mandatory fields cannot be filled ;( and the form thus cannot be submitted. Go here for more Repair info.